Is it possible to simulate an AX-12 Dynamixel device with an ARDUINO? Any help, link o reference? Yes, you can do that. The ARDUINO boards use an ATmega168, which is (incidentally) the same processor I use in my boards. for the link to the repository where it is stored. Arduino doesnt have the circuitry to buffer between the RX and TX. Do you think that simply shorting its RX and TX onto the AX12 data line would allow the Arduino to communicate with the AX12 (given appropriate code that would disable RX when TX is talking and v.v.) ? The ATmega UART can selectively switch off the transmit and receive pins while it is operating, which is what the code my brother wrote does. In general, the Tx pin is disabled, and its in receive mode. When it needs to transmit an answer back again, it disables the Rx pin, enables the Tx, and then sends the response, and switches them back again. so you dont use the 748C126 component recommended by Robotis ? I use that for my USB interface, because you need it. But the AVR can handle in software what the tristate buffer is doing in hardware. i didn't know that you had modules working this way. 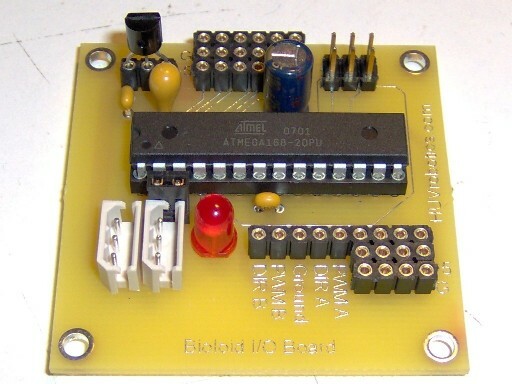 This issue was discussed before here with relation to the Pepper board and somehow I got the impression that there was some kind of electrical or signal problem with shorting the RX and TX on the Atmega. But this is great news because it means that basically any Atmega controller board (with the 1mbps UART) can control the Bioloid bus. Yeah, as long as you have either an 8Mhz or 16Mhz crystal/oscillator, or use the built-in 8MHz one, you can do this. ... so... do i need any aditional hardware to conect both devices...? i saw a thread from somewhere, some one use pnp transitor to create ttl half duplex....anyone know anything about it? If you follow the instructions I posted above last year, you should be good.